This Hubble Space Telescope image reveals the first moon ever discovered around the dwarf planet Makemake. The tiny moon, located just above Makemake in this image, is barely visible because it is almost lost in the glare of the very bright dwarf planet. Peering to the outskirts of our solar system, NASA’s Hubble Space Telescope has spotted a small, dark moon orbiting Makemake, the second brightest icy dwarf planet — after Pluto. The moon, in the Kuiper Belt, provisionally designated S/2015 (136472) 1 and nicknamed MK 2 — is more than 1,300 times fainter than Makemake. MK 2 was seen approximately 13,000 miles from the dwarf planet, and its diameter is estimated to be 100 miles across. Makemake is 870 miles wide. The dwarf planet, discovered in 2005, is named for a creation deity of the Rapa Nui people of Easter Island. 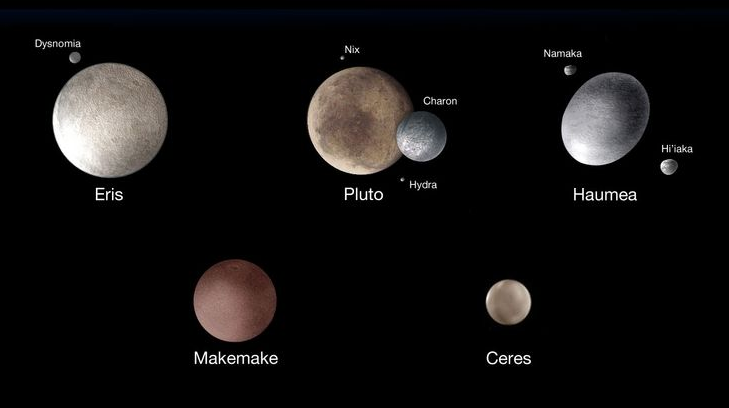 There are 5 officially recognised dwarf planets in our solar system, they are Ceres, Pluto, Haumea, Makemake and Eris. The observing team used the same Hubble technique to observe the moon as they did for finding the small satellites of Pluto in 2005, 2011, and 2012. Several previous searches around Makemake had turned up empty. “Our preliminary estimates show that the moon’s orbit seems to be edge-on, and that means that often when you look at the system you are going to miss the moon because it gets lost in the bright glare of Makemake,” said Alex Parker of the Southwest Research Institute, Boulder, Colorado, who led the image analysis for the observations. A moon’s discovery can provide valuable information on the dwarf-planet system. By measuring the moon’s orbit, astronomers can calculate a mass for the system and gain insight into its evolution. Uncovering the moon also reinforces the idea that most dwarf planets have satellites. Actual Hubble image – Makemake is the third biggest dwarf planet and is roughly 3/4 the size of Pluto. Finding this moon only increases the parallels between Pluto and Makemake. Both objects are already known to be covered in frozen methane. As was done with Pluto, further study of the satellite will easily reveal the density of Makemake, a key result that will indicate if the bulk compositions of Pluto and Makemake are also similar. “This new discovery opens a new chapter in comparative planetology in the outer solar system,” said team leader Marc Buie of the Southwest Research Institute, Boulder, Colorado. The discovery may have solved one mystery about Makemake. Previous infrared studies of the dwarf planet revealed that while Makemake’s surface is almost entirely bright and very cold, some areas appear warmer than other areas. Astronomers had suggested that this discrepancy may be due to the sun warming discrete dark patches on Makemake’s surface. However, unless Makemake is in a special orientation, these dark patches should make the dwarf planet’s brightness vary substantially as it rotates. But this amount of variability has never been observed.